Alex Smith's Yamarin Cross 64 BR review takes a fresh look at the pinnacle of Yamarin’s extraordinary Cross fleet. When we witnessed the debut of Yamarin’s new Cross line flagship in Dusseldorf, it was very easy to be impressed. 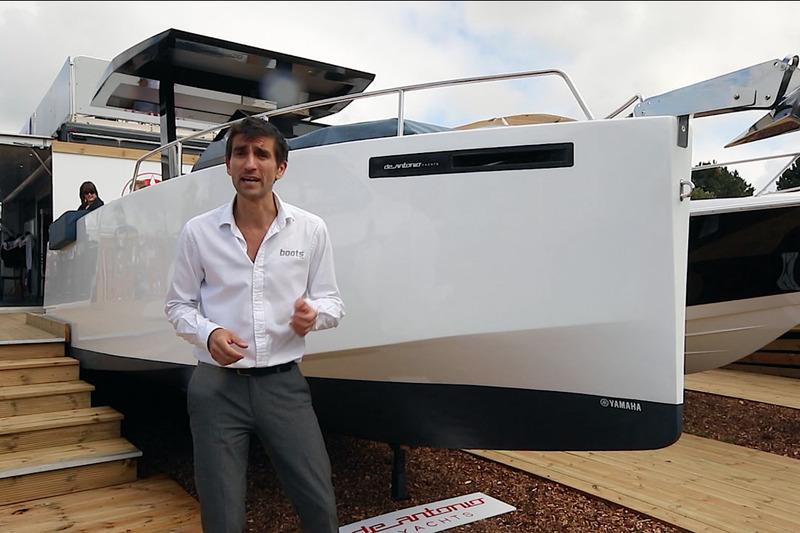 After all, the combination of a robust aluminium hull and stylistically clean GRP topsides had already proven a huge success for Yamarin, virtually supplanting its traditional fibreglass range at a stroke. Naturally then, what we expected to see from the new 75 BR was that same innate conceptual calibre, amplified and presented afresh, on a larger, faster, more powerful platform than ever before. That was precisely what we got – and yet when you consider the merits of the 75 in tandem with those of the more modest 64 BR (launched only six months earlier), the position of the fleet’s true high point is by no means as clear cut as you might imagine. 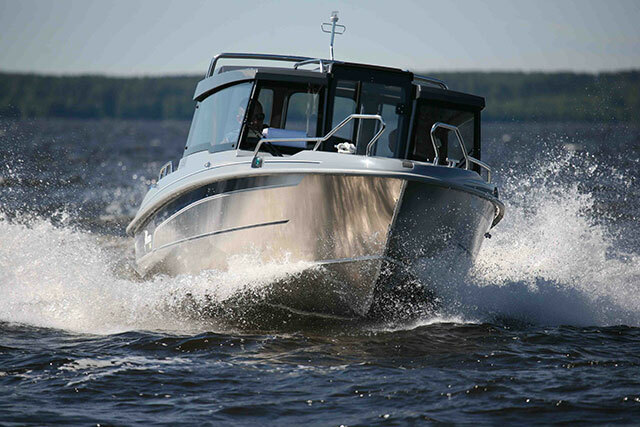 The 64 BR has recently been outmuscled by the 300hp 75BR. There are plenty of positive ways in which the 64 BR echoes the larger 75. For a start, they are both built from 5083 aluminium, which is reputedly 30 per cent stronger than the 5754 grade used on a great many leisure boats. 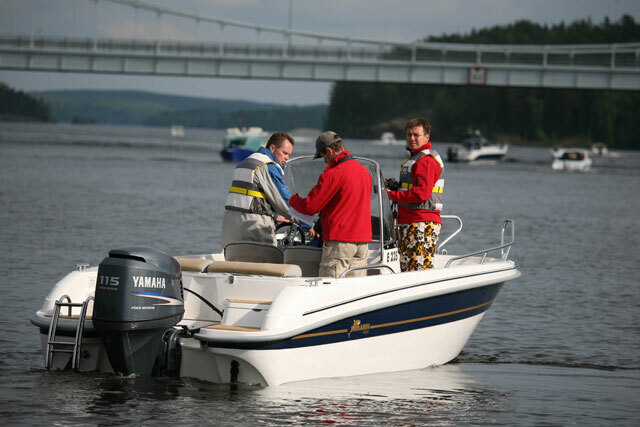 They also use a very Scandinavian form of bow rider configuration, where the bow is not so much a place to lounge (in the classic American style) as a place to sit, walk, store your equipment and attend to the seamanship practicalities of a day out. Seating for eight on the 64 BR is well up to par. There are steps to embark and disembark on both sides, just ahead of the screen, plus a very safe step-through bow with elevated guardrails to help you nose into a beach while leaving the prop in deeper water. There’s an anchor at the stern as well as the bow and the removable box to starboard is also a very gratifying idea. 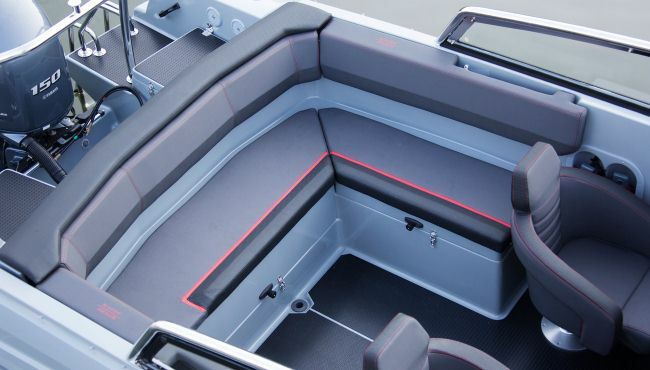 You can use it as a step, a seat or a storage compartment – and if you decide you need more deck space (for instance, for fishing, diving or load carrying), you can simply unscrew the finger bolts that attach it to the boat and leave it behind. We’ve certainly seen this system before, most notably on the modular decks of Yamarin’s Finnish rival, Buster, but its appearance here is no less welcome for that. The commonality in DNA between the 64 BR and the new flagship 75 continues elsewhere. 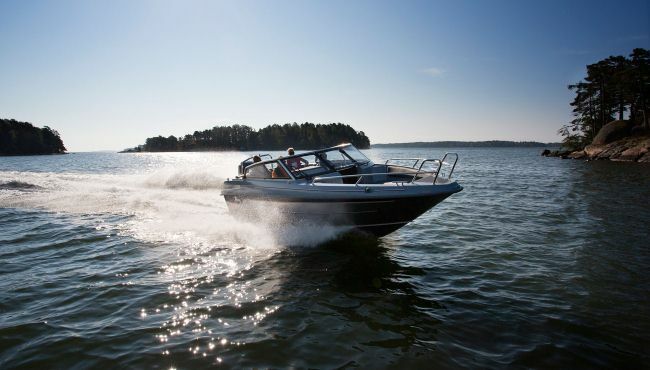 You get great ease of movement from bow to stern, grab rails that stand prouder than on previous models and a very sturdy windscreen with a more upright profile and longer side panels for much better cockpit protection than most comparable bow riders. That overlap in design and purpose also manifests itself in the aesthetics, but that’s by no means a bad thing. 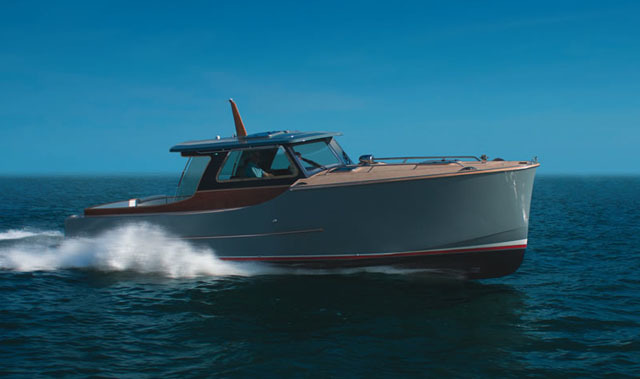 On the contrary, the workmanlike practicality of the features list might lead you to expect an angular, steep-sided profile, but with dark, tapered hull graphics just below the rubbing strake and a clear, uncluttered style governed by granite colourways and bright steel highlights, the 64 is a peculiarly attractive boat. The bow uses a step-through rail, plus a storage box and a fixed seat. There seems to be a bit of a power race underway in Scandinavia and to me, it feels very much at odds with the region’s mature and sophisticated boat building reputation. Yamarin has certainly dipped its toe into the madness with the 300hp option on its 75 BR; and Buster has also committed itself with lusty and uncontained gusto in the form of its wildly overcooked 350hp Magnum M5. However, despite its pleasing high-performance edge, Yamarin’s ‘second-tier’ 64 BR looks like a much more productive and sustainable offering than these ferocious, no-holds-barred big boys. Up at the helm, you get proper offshore seats for both driver and co-driver with excellent back and lateral support. You also get an elbow rest, a foot brace, generous adjustability, high-grade materials and a well-arranged dash with plenty of space for after-market additions. 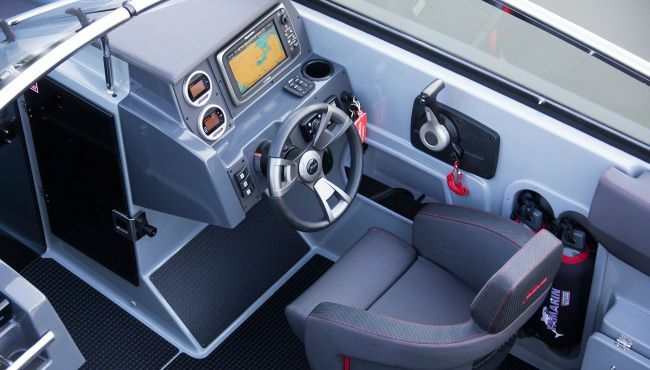 And if the driving station is every bit as comfortable and exhaustively equipped as that of the 75, then what is particularly surprising is how closely related these boats feel in terms of performance. The deepset helm is supremely well equipped. While the flagship 75 is capable of 37 knots on 150hp and 50 knots on 300hp, the more moderate and affordable 64 is not far away at all. 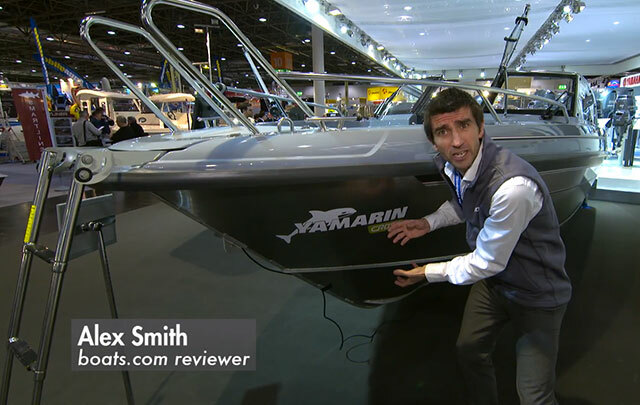 Not only will it hit 36 knots with the F115 but it will also go beyond 45 knots with just the F150 on the transom. True, that’s around 8 per cent less at the top end, but on the smaller boat it gets there just as quickly and it feels every bit as rapid in the process. 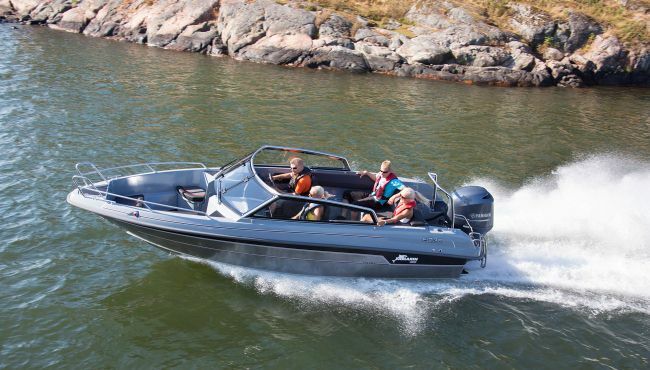 In any case, 45 knots is easily enough for most family boaters; and given that these boats use relatively lightweight, shallow-angled aluminium hulls, the smaller boat also brings with it the promise of a slightly more comfortable ride. 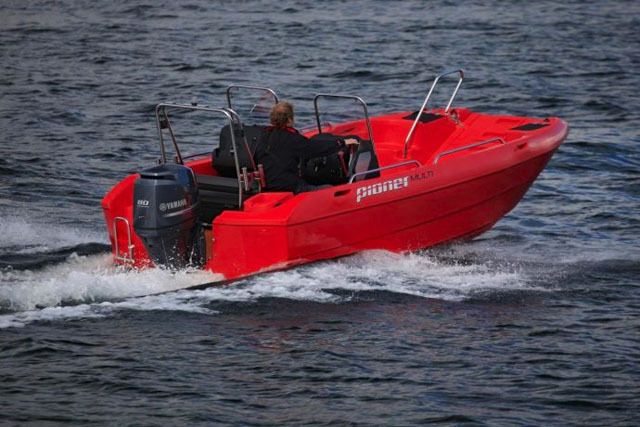 In short, with a comparable helming experience, plus seating for up to eight people (just one fewer than the bigger boat), and far greater affordability both in terms of purchase price and running costs, it’s very difficult to consider the 64 BR second best in any significant regard. There is no doubt that the new flagship 75 BR is an entertaining package and a bold statement. But if you want a versatile and sporting bow rider from a serious builder that sidesteps the rather puerile crusade for super-powered excess, the facts speak for themselves. For its potent fusion of helming heroics and everyday common sense, the excellent 64 BR remains the best bow rider in the Yamarin Cross fleet. For me, the 64 remains the best bow rider in the range. 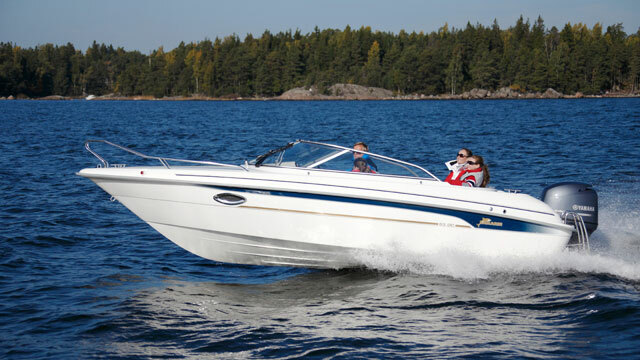 For an interesting comparison review, see: Sea Ray 19 SPX: a bow rider with breadth or Larson 850 LX: entry-level bow rider.